Shiny Bright Polished 10K White Gold! The Ring Is Stamped "10K CI" On The Inside Of The Shank. 1 - Approx.025 (1/40) Carat Round Single Cut Diamond - I2 Clarity, I-J Color. This Sparkly Ring Features A 3-Stone Design With Three Seven Diamond Round Clusters! Solitaire Rings. Wedding Bands. Diamond Ring Three Stone 0.3CTW (Center Stone 0.3ct) in 14K White Gold. Each stone is hand picked and inspected making sure that it has the ultimate sparkle and brilliance. The diamond is H-I in color and SI2-I1 in clarity. The ring is a size 9.25 and weighs 4.80 grams. We try to provide the BEST quality jewelry at the most reasonable price. The issue will be resolved. 1 round diamond. 30ct 4.15x2.80mm. 2.52mm wide front face of ring (across top to bottom). 1.55mm wide back shank (most narrow area of the band). Diamond Information. Photos have been enlarged to show detail. This stunning solitaire Diamond Ring is in excellent condition and features a bright white round brilliant-cut Natural Diamond, weighing. 30 carats. It shines from within a simple four prong setting of white gold and mounted on a 14K White Gold shank. 14K WHITE GOLD ROUND. 32CT DIAMOND. 4.2mm DIAMOND. The head and the pattern all around gives this ring a unique infinity style look. Center Raise: 7.00mm. Diamond Shape: Round. Total Carat Weight: 0.25 Ct. When the manufacture makes errors, it can lead to a defect in the item stone setting. Center Raise: 5.5mm. Diamond Shape: Round. When the manufacture makes errors, it can lead to a defect in the item stone setting. Our warranty covers manufacture defects such as loose stones or missing stones caused by the failure to tighten prongs when setting the diamonds. Up for sale is a previously worn Ladies 10K. 32 CTW Diamond Halo Cluster Ring. This beautiful ring features a cluster of Round Brilliant Cut Diamonds in a halo design setting. There are a total of (39) Round Brilliant Cut Diamonds with an estimated total weight of. 32 ctw , an approximate average clarity grade of SI2-I1 and color grade of I-J . Diamonds are set in 10K White Gold. Center Raise: 3.91 mm. Diamond Shape: Round. When the manufacture makes errors, it can lead to a defect in the item stone setting. Our warranty covers manufacture defects such as loose stones or missing stones caused by the failure to tighten prongs when setting the diamonds. 2.6 Grams in 10K White Gold. TOTAL DIAMOND WEIGTH. 25 CTW CARATS.25CT in Round Diamond Cut. Diamond Triple Halo Engagement 10k White Gold Round Cut Wedding Ring 0.25 Ct. This ring is set in real 10K White Gold and real round cut diamonds in pave setting. Diamonds are set close together around the halo for a uniform and clean look. The diamonds are machine set precisely to give it a clean finish. Can be adjusted to fit solitaire ring. 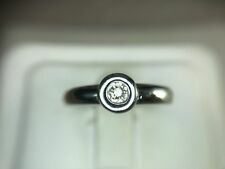 Fits Standard 1 Carat Solitaire Ring. Details: Total Weight: 2.3 Grams | Total Carats: 0.25 Carat | Setting: 14K, White Gold | Ring Size: 6 | Width: 8.5 mm (0.3in) | Item Length: 8.5 mm (0.3in) | Diamonds: Natural, Real | Period/Style: Modern | Condition: New | Includes: Deluxe Presentation Box. Diamonds are set in 10K Rose Gold. Center Raise: 5.63 mm. Diamond Shape: Round. When the manufacture makes errors, it can lead to a defect in the item stone setting. Our warranty covers manufacture defects such as loose stones or missing stones caused by the failure to tighten prongs when setting the diamonds. Costozon Natural Diamond Solitaire Anniversary Ring 0.30 Carat 10Kt White / Yellow Gold Certified Hallmarked 4.3MM. LIMITED PIECES AVAILABLE! Diamond Carat: 0.3 CT. Diamond Cut: Very Good. Diamond Color: J. Condition: Estate item in a condition consistent with wear and age. Filigree has worn through in one spot on bottom side of the ring, this is not visible when the ring is worn (see photo 8), shank 0.7mm wide in the back, prongs are in a good condition. STAMPED 14k AND LOGO. ROUND CENTER DIAMOND WEIGHTING. DIAMONDS WELL MADE IN SOLID WHITE GOLD. TOTAL ITEM LENGTH. 4mm, HEIGHT 5mm. 14K -. 585. Cut: Round Brilliant. Since, we were created on a foundation of jewelers, based on jewelry repair. We specialize in jewelry sales, repair, and customizations for any and all types of jewelry. 10kt White Gold. Our huge collection of products includes rings, fashion and wedding bands, bridal jewelry, pendants, gems and much more! Wedding Jewelry. Combined diamond weight of 1/3 carats total weight represents a range of 0.30 - 0.36 cts. Center Raise: 5mm. Diamond Shape: Round. When the manufacture makes errors, it can lead to a defect in the item stone setting. Our warranty covers manufacture defects such as loose stones or missing stones caused by the failure to tighten prongs when setting the diamonds. Ladies 14K White Gold Marquise Diamond Solitaire Engagement Bridal Ring 0.25 Ct.
Diamond Shape: Marquise / Round. Fancy Diamond Color: White. Diamond Information. Combined Band Width: 3mm. Diamond Cut: Good. Diamond Clarity: SI3 - I1. Diamond Color: H - I. Diamond Setting: Prong / Channel. This ring is set in real 10K White Gold and real round cut diamonds in prong setting. Center Raise: 4.50mm. Diamond Shape: Round. When the manufacture makes errors, it can lead to a defect in the item stone setting. Color I-J, with a clarity of I1. We will work with you to resolve any problems. An elegant way to enhance a solitaire ring is with ring enhancer crafted in 14K White Gold. This stylish Double guard is set with round sprakling genuine diamonds 0.25 ct which are prong set on shank. Costozon Natural Diamond Solitaire Anniversary Ring 0.25 Carat 10Kt White / Yellow Gold Certified Hallmarked 4MM. Diamond Size: 4MM x 4MM. LIMITED PIECES AVAILABLE! Diamond Carat: 0.25 CT. Diamond Cut: Very Good. Make the promise to love her always. Radiant with 0.25 ct. t.w. of diamonds, this ring is finished with a polished shine. Diamond are H-I color (near colorless) clarity 11-SI2. I took these picture from my phone so if you like these here you will love these in person. This item is not gold plated, gold electroplated or gold filled. Resolution is filed after step # 6. This is real gold. Gift box included. Marked "10". CONTINENTAL USA ONLY. If you have any issue with the item. vintage diamond ring 18kt white gold filigree setting sz 6.50 wgt 2.7 grams tcw. Stamped 18kt weighs 2.7 grams or 1.7 dwt. Has 5 round cut diamonds 1 in a seven point size/4 in five point size. Ladies 10K White Gold Diamond Flower Engagement Ring Wedding Band 0.32 Ct. Combined Band Width: 3mm. Fancy Diamond Color: White. Diamond Information. Diamond Shape: Round. Diamond Cut: Good. Diamond Clarity: I1 - I2. Diamond Color: H - I. Diamond Setting: Prong.